At the 2011 Pediatric Bipolar Disorder Conference in March, Steven V. Faraone from the State University of New York Upstate Medical University presented a plenary paper in which he described how to distinguish deficient emotional self-regulation from traditional mood disorders. He found that deficient emotion regulation was closely related to ADHD, and progressively less similar to oppositional defiant disorder, anxiety disorders, major depression, conduct disorder and, lastly, bipolar disorder. 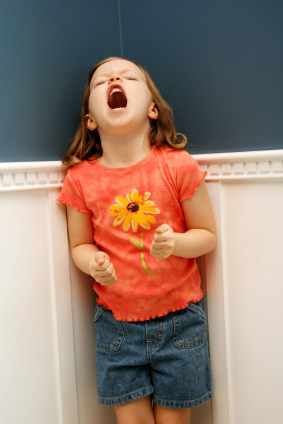 The behaviors associated with deficient emotion regulation are also prevalent among the siblings of children who have received the diagnosis. Deficient emotional self-regulation often occurs in families where ADHD is also present, but does not have a familial association with bipolar disorder or other comorbidities. Multiple factors make childhood-onset bipolar disorder a difficult problem for affected children and families. 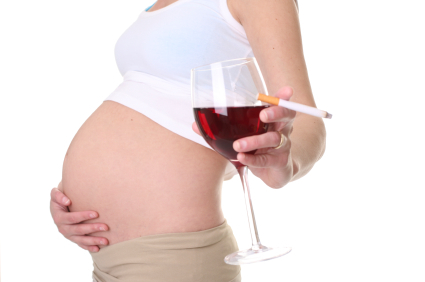 Early onset is common, and treatment is often delayed or inappropriate. It takes an average of nine months to achieve remission, and relapses are common. In studies children have remained symptomatic for an average of two-thirds of the time they receive naturalistic follow up treatment, and the illness impairs social and educational development. 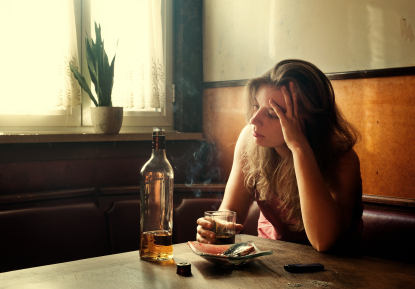 Episodes and stressors tend to accumulate, and substance abuse is a frequent complication. Dysfunction and disability occur at a high rate among children with the illness, and suicidal ideation and acts are common. As we wrote yesterday, repeated transcranial magnetic stimulation (rTMS) is a treatment in which a magnetic field is applied to a patient’s head, where it is able to affect tissue 2-3 centimeters into the brain. The major studies of rTMS, by O’Reardon and colleagues (2007) and George et al. (2010), were performed with patients who were medication-free during the course of rTMS treatment. 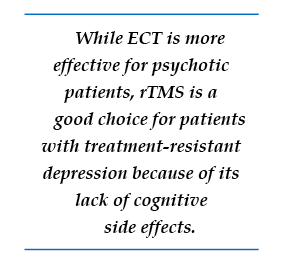 However, it is routine clinical practice to use rTMS as an adjunctive treatment to ongoing antidepressant therapy, and in these cases, response rates appear to be close to 50%, even in patients with considerable treatment resistance to prior antidepressants. 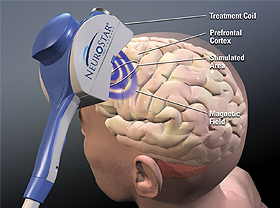 Using the FDA-approved parameters, treatment is typically delivered with with an rTMS machine that stimulates the left prefrontal cortical area of the brain at a stimulation intensity of 120% of the patient’s motor threshold at a frequency of magnetic impulses of 10 per second or 10 Hz. The motor threshold is the intensity of stimulation necessary to cause the thumb to move when the motor cortex is stimulated, but the treatment is given over the frontal cortex which does not produce any movements or other sensations. Each treatment lasts for about 20 minutes and does not require any anesthesia or premedication. The patient is awake and alert during the procedure, and cognitive side effects are minimal. Patients occasionally experience some pain from contraction of the scalp muscles under the magnet. The rapid reversal of the magnetic field occurring ten times per second induces electrical stimulation of the brain at the same frequency and causes discharge of neurons. High frequency (at 10 or 20Hz) neuronal activity appears to increase activity (blood flow or metabolism) in the brain, while lower frequency stimulation, such as at 1 Hz, appears to decrease brain activity. In both cases, the effects last at least 48 hours after the last of a two- or three-week series of treatments. RTMS increases brain-derived neurotrophic factor (BDNF) in the brain, and BDNF is released when nerves fire at a fast frequency. 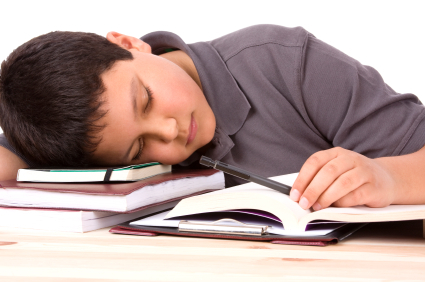 The release of BDNF appears to be necessary for long-term learning and memory. As reported in the BNN last year, a study by George and colleagues that was published in the Archives of General Psychiatry provided independent support and replication of earlier findings that active repeated transcranial magnetic stimulation (rTMS) is more effective than a sham procedure in the treatment of partially drug-resistant depressed patients. RTMS is a treatment in which a magnetic field is applied to a patient’s head, where it is able to affect tissue 2-3 centimeters into the brain. According to Neuronetics, the company that produces the rTMS machine, “The magnetic field passes through the hair, scalp, and skull and into the prefrontal cortex unimpeded. This method allows for precise, targeted stimulation, minimizing the stimulation of brain tissue not involved in mood.” The Federal Drug Administration approved the Neuronetics rTMS machine after a large, multi-center sham-controlled study was published by O’Reardon et al. in Biological Psychiatry in 2007. Since the FDA approval, availability of rTMS treatment and insurance reimbursement for the procedure have improved. A number of hospitals and private practitioners around the country are now able to offer treatment with rTMS. The Neuronetics website allows patients to search for sites where the treatment is offered. While a treatment sequence typically consisting of treatment five times a week for four to six weeks is relatively expensive (often in the range of $8,000-$12,000 or more for the series), some health insurance plans will now (perhaps after some argument and negotiation) cover some of the cost of treatment. It was estimated by Neuronetics personnel that about 75% of the time, with the assistance of Neuronetics and the physician staff delivering the rTMS, such insurance coverage can successfully be arranged. Neuronetics suggested that even if the claim is initially rejected, many treatment series will eventually be covered. Neuronetics also provides assistance for patients with annual income under $42,000. These patients may be able to receive treatment free of charge. In addition, for those who have a higher income but are uninsured, Neuronetics offers a loan program for the gradual repayment of the cost of the procedure. Stay tuned for more articles about rTMS this week! At the 57th Annual Meeting of the American Academy of Child and Adolescent Psychiatry (AACAP) in New York in October 2010, Tim Wilens of Massachusetts General Hospital (MGH) presented data that maternal smoking and alcohol use during pregnancy both appeared to increase the risk of comorbid attention deficit hyperactivity disorder (ADHD) in children with bipolar disorder. Eric Mick of Massachusetts General Hospital reviewed the latest genetics data on bipolar disorder and reported at the 57th Annual Meeting of the American Academy of Child and Adolescent Psychiatry that 20% of people with childhood-onset bipolar illness have a first-degree relative with bipolar disorder, while only 10% of those with adult-onset bipolar disorder have a first-degree relative with bipolar disorder. 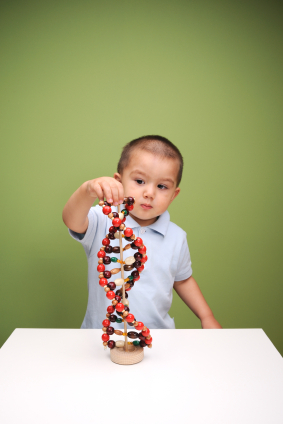 These data are consistent with others that indicate that there is an increased genetic/familial risk for bipolar disorder in childhood- compared with adult-onset illness. 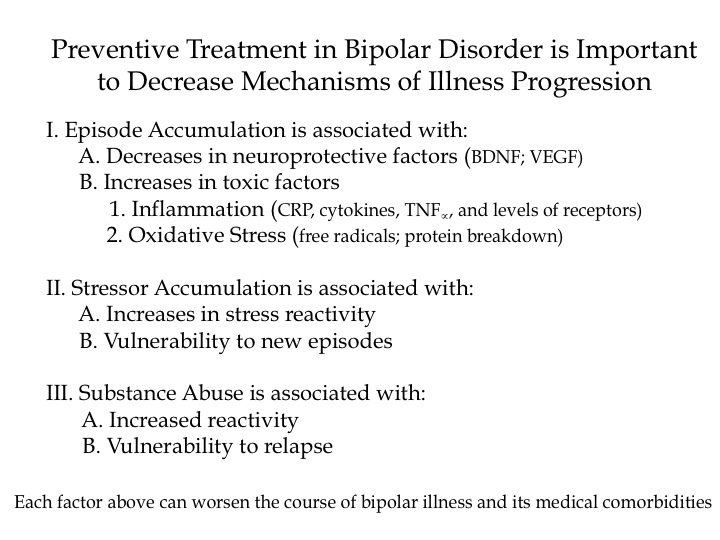 Mick reviewed a number of findings that suggest that alterations in genes involved in intracellular signaling and in the development and maintenance of long-term memory may also be implicated in bipolar disorder. Classical genome-wide association studies (GWAS), in which a link between any human gene and bipolar disorder is sought, have not found any genes with a large effect or a high predictive value for bipolar illness. In the meantime, other strategies for finding genetic links to bipolar disorder are being pursued, including studying rare gene variants. There is some evidence that these variants occur more frequently in children with early onset bipolar illness. At a symposium on new research on juvenile bipolar disorder at the meeting of the American Academy of Child and Adolescent Psychiatry (AACAP) in 2010, Ronna Fried from Massachusetts General Hospital reviewed executive function deficits that occur in children with bipolar disorder. These include difficulties in planning, working memory, response inhibition, emotional control, initiative, self-regulation, and the ability to shift focus when required. Fried and her research group found that comorbid ADHD occurred in 69% of bipolar I children compared with 16% of controls. (ADHD involves many of the same executive function difficulties that occur in bipolar disorder—poor attention and difficulties with learning and memory.) Executive function deficits were observed in 45% of bipolar I patients compared with 17% of controls. Children with bipolar disorder who had executive function deficits had lower IQs, more difficulty reading, lower social functioning, decreased occupational functioning on long-term followup, and overall poor outcome of their illness. Editor’s Note: These data emphasize the importance of cognitive remediation techniques in those who have major executive function deficits. Dr. Fried emphasized that rehabilitation works, and indicated its use is important for these children in order to moderate the otherwise more severe course of illness they may experience compared with those without executive function deficits.